Have you ever been through the experience of having the FDA refuse to accept your 510(k) submission? This has happened to a number of medical device companies, usually because something is missing from the required documentation. Your premarket notification, the 510(k) submission, is a vital part of the process to get through before your device can reach the market, so it’s important that you understand what is required in the submission. I recently had a chat with an expert on this subject, consultant, PhD, RAC and former FDA reviewer, Allison Komiyama. She started her consulting practice, AcKnowledge Regulatory Strategies, in order to serve clients all over the world, large and small, who manufacture implantable and other patient-contacting medical devices. Free Bonus Checklist: Get our free quick 510(k) submission checklist here. About 50% of all devices on the market are 510(k) cleared, so this is a large part of the FDA’s work. What happens when a submission is sent in? After it arrives it goes up to the branch chief, who decides which team member gets it for review. The lead reviewer will then go through the “refuse to accept” checklist to ensure that all components are included that are asked for. They’ll get back to the sponsor (manufacturer) within 15 days to let them know whether it has been accepted. Once the decision has been made to accept, the lead reviewer might farm out different components of the submission to different team members where necessary for review. This will be based on the expertise of the different team members. When they rolled this policy out, many people weren’t huge fans of it, but overall Allison feels it has been a good thing. It has reduced the amount of time the agency spends reviewing and makes it clear to device manufacturers what FDA actually wants. This has meant overall quality of submissions has improved, although of course it takes additional time for reviewers too (it’s a 10-page document!). Allison’s recommendation is to include a copy of the Refuse to Accept Checklist with your submission, fill it out and note the page numbers next to each list item. This can help your submission to get accepted a lot quicker than it would otherwise. In my experience, where I submitted a 510(k) without the checklist filled out, the submission was significantly delayed with a lot of questions being asked. When I submitted a different 510(k) a few months later, this time with the checklist filled out, things went a lot smoother and acceptance was much quicker. What about “I promise” statements? Once upon a time, you could make “I promise” statements with your submission, promising to do testing later on. The FDA has since backed well away from this, with a good example being sterilization validation. This must be completed prior to submission and is included in the Refuse to Accept Checklist. If evidence that testing has been conducted is not present, your submission will be refused. As Allison says, you don’t need to submit the actual report, but you do need to state how it was done. With biocompatibility and electrical testing, they’ll want to see reports to ensure it has been done properly. Back in the day, there were a number of incidents of companies making those “I promise” statements then conveniently forgetting about them later on. The FDA just wants to ensure that appropriate safety testing has been done. Allison has significant experience as a specialist with biocompatibility testing. She advises that there is definitely weight in predicate devices, especially if it’s your own. If it’s a new material, the FDA recently came out with a new document advising manufacturers about working with ISO 10993, which Allison suggests is a good place to start for biocompatibility advice. If you’re using material that has been around for a long time (such as stainless steel), you probably won’t need a full gamut of testing. On the other hand, new materials may require additional testing in order to be approved. How did they manage to put together a 510(k) submission without design controls in place? This would be no easy task as your documentation directly informs the 510(k) submission. My tip for everyone out there is that this is not something you’re going to get back to later, it almost never works that way. Put together those design controls as you’re doing it, not after the fact. You don’t want to have to do a whole lot of cleanup before going to market, yet if you don’t get it done, you run the risk that the FDA is waiting in your lobby tomorrow to conduct an inspection and they will find those things you haven’t done. If you have a Class II or Class III device, inspections are mandated so count on them happening. As Allison says, the FDA is not an agency where you want to ask forgiveness rather than permission. You need to make sure you’re doing things correctly in the first place - the regulations are there for a reason and forgiveness is unlikely. Allison adds that you should make sure you have a system in place that works for your company. This depends on the size of your company and the device that you’re building. Testing should make sense and you should be going to the FDA with the best validation reports that you can. Any questions of safety or efficacy will trigger a red flag with the FDA and cause them to want further investigation. You should have implemented a design freeze and have done all testing on the final device. This is key for 510(k) approval - remember the reviewer just wants to ensure a safe device is going to market. Remember, reviewers are human. They are under a lot of pressure to ensure that only safe devices are cleared and there is a chain they have to go through, justifying their decision. Indications for Use statement doesn’t match throughout the submission. The reviewer WILL notice this is off, you’ll be refused, then sent back to Day Zero on their clock. Failing to follow the guidance document. This walks you through what reviewers need. Failing to follow the Refuse to Accept checklist. 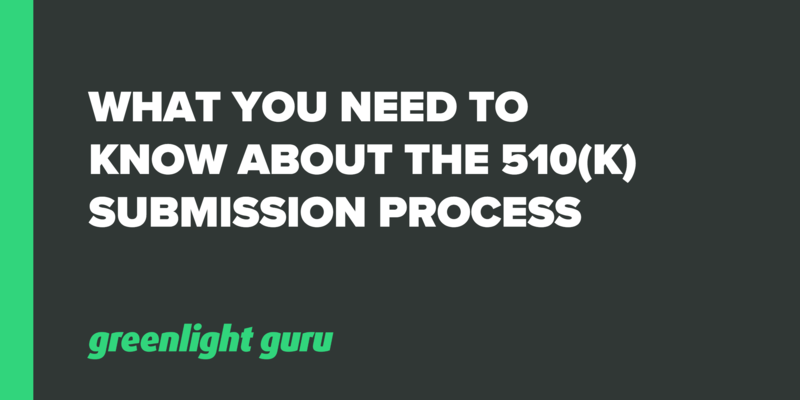 What is the timeframe for the 510(k) process? This is a perfect example of “it depends.” Those dependencies can be the device itself, the branch doing the review or the individual reviewers. The average now seems to be around 125 days, although some are shorter or longer. The fastest Allison ever saw was 34 days. In my own experience, 6 to 11 months is a fair time period to allow for. There are often questions that come back or extra evidence required. Look out for any recent recalls of similar or predicate devices because these will give you an idea of issues that the FDA will be hot on. The 510(k) premarket submission process is necessary for about 50% of all medical devices, so there’s a good chance yours is one of them (it definitely is if it is a Class II or III device). The approval process itself can be lengthy, but oftentimes medical device companies haven’t helped the FDA to help them make it smoother. You should take the time to ensure that everything has been correctly included that is required, otherwise you risk your submission getting pushed back and starting over at day zero. Help smooth the process by being clear in your documentation and going through the Refuse to Accept checklist before submission. Note page numbers next to checklist items and in general, do your best to make the FDA’s job easier if you want a quicker path to market. Still using a manual or paper-based approach to manage your design controls or quality processes? Click here to learn more about how greenlight.guru's modern eQMS software platform exclusively for medical device companies is helping device makers all over the globe in more than 50 countries get safer products to market faster with less risk while ensuring regulatory compliance.